THE START OF A STRONG FOUNDATION – The junior curlers and their coaches collect the rocks they have just thrown as part of an instructional clinic led by three-time Olympian Kevin Martin. Martin says growing a strong curling program is reliant on the development of the young curlers. ATTENTION TO DETAIL — Kevin Martin and Wade Scoffin watch as the player on the hack prepares to throw. They observed players from the hack to the point of delivery, making sure their aim was accurate. Martin and the coaches closely watched every player, looking for the best ways to adjust technique and add to their fundamental curling base. Kevin Martin has been to Whitehorse twice before. Kevin Martin has been to Whitehorse twice before. Once in 1999 for the McCain Skins game, where he lost in the finals to Wayne Maddaugh. He was in Whitehorse again in 2009 for a World Curling event, which he and his team eventually won. 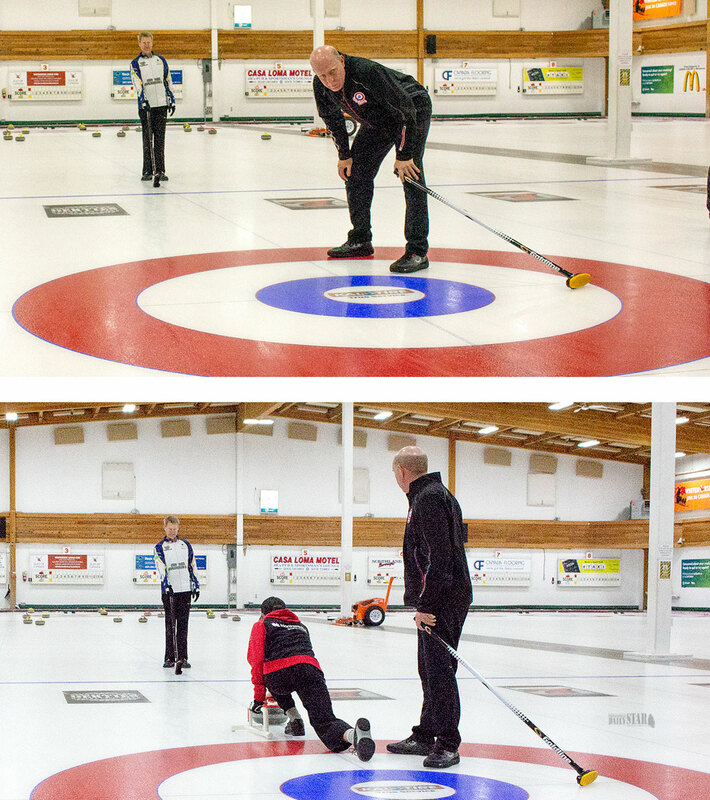 Martin was back in Whitehorse over the weekend, after nine years away, not to play, but as a coach to all those who wished to attend the clinics that were hosted by the curling club. Although it has been nearly a decade since Martin was in Whitehorse, he remembered the curling club well. Martin, now retired from professional curling, is still an active member of the curling community. Despite working around other ventures such as his sports store and working as a television analyst, he remains dedicated to growing and developing the sport. Martin says the Whitehorse Curling Club is excelling in these two areas. According to Martin, curling is one of the fastest growing sports in the world, winter and summer. Part of it, is the growing popularity of the Olympics, as well as an increase in television exposure, this rise in popularity is noticeable to Martin at the ground roots level. Developing the youth program is the key to sustainability in the sport, according to Martin, something he believes Whitehorse is doing well. Like any sport, coaching is pivotal to sustaining and achieving success. Martin was really impressed with the turnout of coaches who assisted him in running the days clinics. “We had all those kids this morning, but we had five instructors out there with me,” said Martin. Part of Martin’s mission in growing the game is to develop the coaching. Which is why he tries to fit as many instructional clinics into his schedule as he can. “Having a lot of kids in a youth program is great, but the other side of that is you need the coaching,” said Martin. “You need to get the 12 and 13 year-olds well coached so they have the fundamentals and the technical side to get picked up by a competitive team. 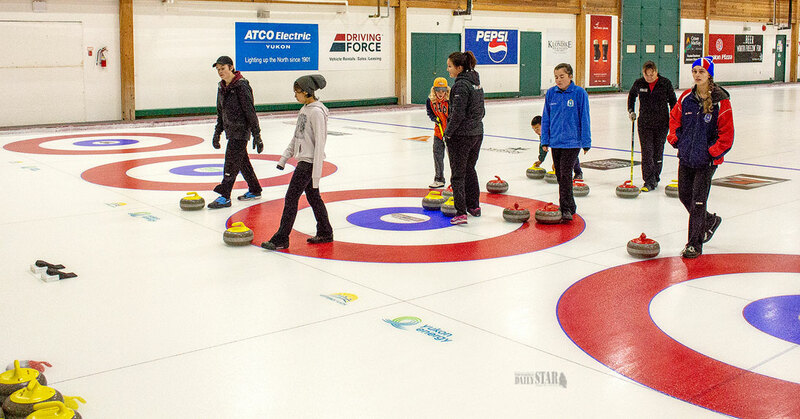 A strong youth program coupled with knowledgeable coaching is the recipe for a strong curling program. Canada has always been a force on the international levels but Martin says other countries are catching up or have caught up to Canada’s level of play. To maintain a strong international presence, it is up to the individual clubs across Canada to have long-term plans to generate quality curlers. As the day came to an end Martin had one more message for all the curlers, to prepare them for their future successes.